Previously we talked about Why Genting is Dropping, one of the reason is due to the Global sector of Gaming, fund managers are dumping Gaming stocks globally. 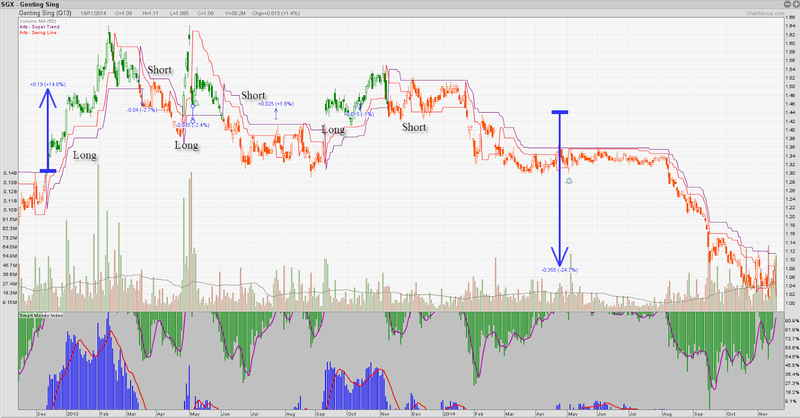 Our Genting Singapore is one of the weakest stock during the Gaming stock bull run in 2012-2013( Compare to LVS, WYNN, Galaxy Entertainment) and this time round where the all the Gaming stock is dropping, Genting Singapore just follow. So now it is bullish already? Base on our Trend follow system, Green candle represent Bullish, Orange represent Bearish, the purple line represent the Resistance. Currently Genting Sing resistance is at $1.12, meaning if the price can close at/above $1.12 the system will give a Bullish Signal. This is Why and How we use our system. You don't need to predict where the price is going, just follow the trend using our system!